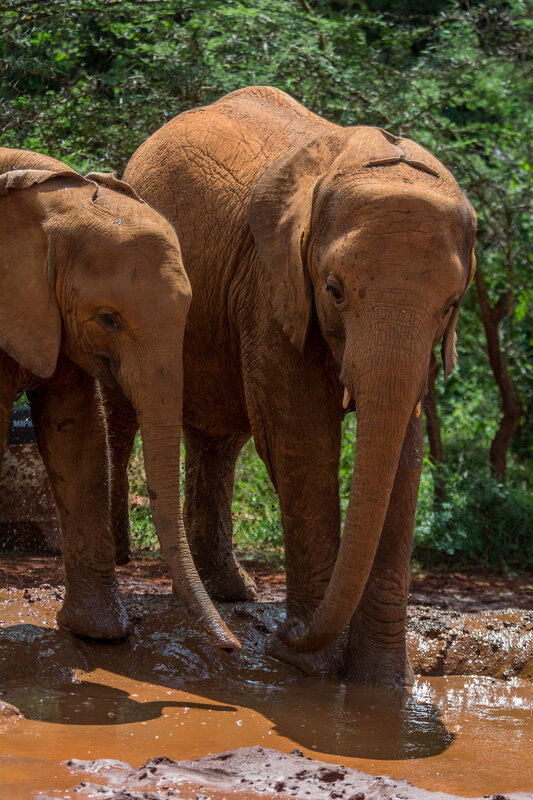 Her name is Malkia and she was rescued from Tsavo National Park by the David Sheldrick Wildlife Trust (DSWT) after her mother died during a very dry season. Wanting to be the best elephant parents we could be, we decided to visit our newest family member at her home in Nairobi, Kenya. To be honest, we booked the flight (a very belated honeymoon) and then adopted Malkia, but that's not the story we tell her. 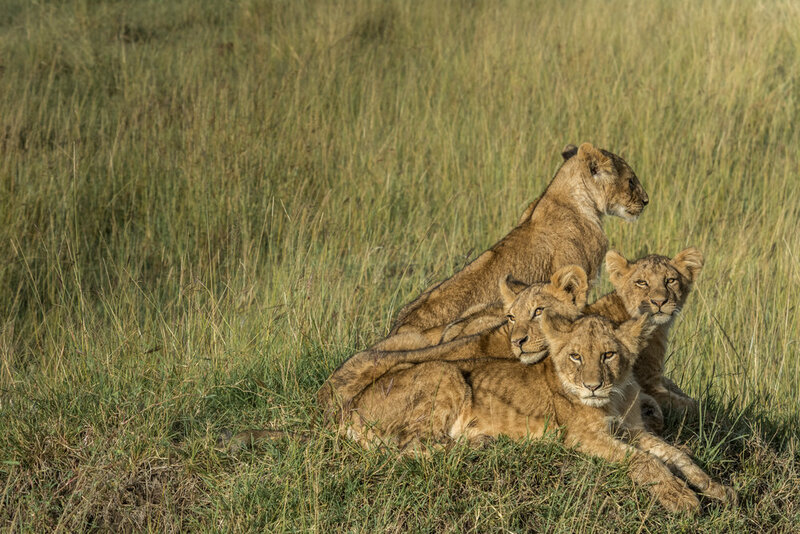 We were in Kenya for just over a week and packed a lot in, mostly taking photos of animals. Highlights included a visit to the DSWT, of course, an orphan-elephant rescue and rehabilitation program that reintegrates orphans back into wild herds. While the elephants are young and still require bottle feeding, though, visitors can attend bottle feeding / mud slinging for an hour at the watering hole. The mud is usually directed at other elephants, except when a certain Vancouverite gets in the way inadvertently and ends up covered from head to toe in mud (and who knows what else). As 'parents' we were allowed to return in the evening to watch the baby elephants charge back into their stockades to be fed a bottle and be put to bed. Each elephant has a keeper that sleeps in their stall, which makes being an elephant 'parent' very easy. We also visited the Giraffe Centre, which educates Kenya's schoolchildren about the country's wildlife and gives visitors an opportunity to come in contact with the resident giraffes. 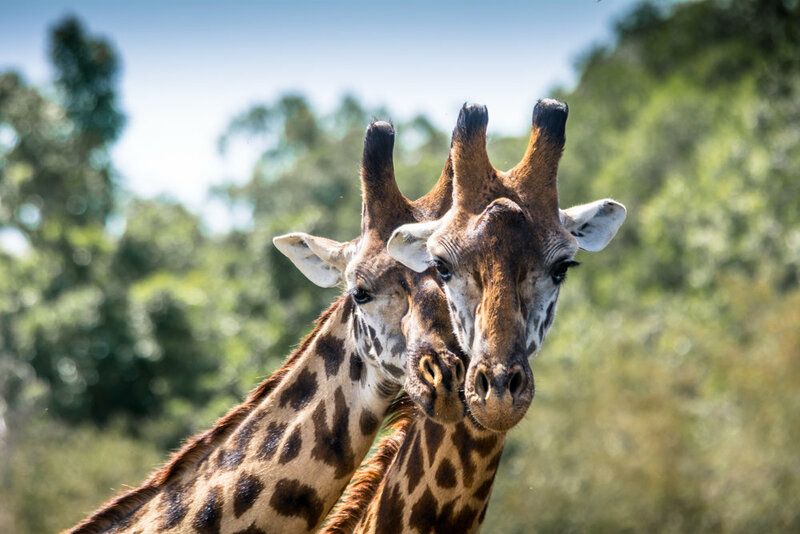 It was started by two Kenyans in an effort to establish a breeding program for the Rothschild Giraffe. Today, there are over 300 of these giraffes in various national parks around Kenya. Some of the giraffes remain at the 60-acre sanctuary and appear at a viewing platform to kiss visitors with their long, purple tongues. 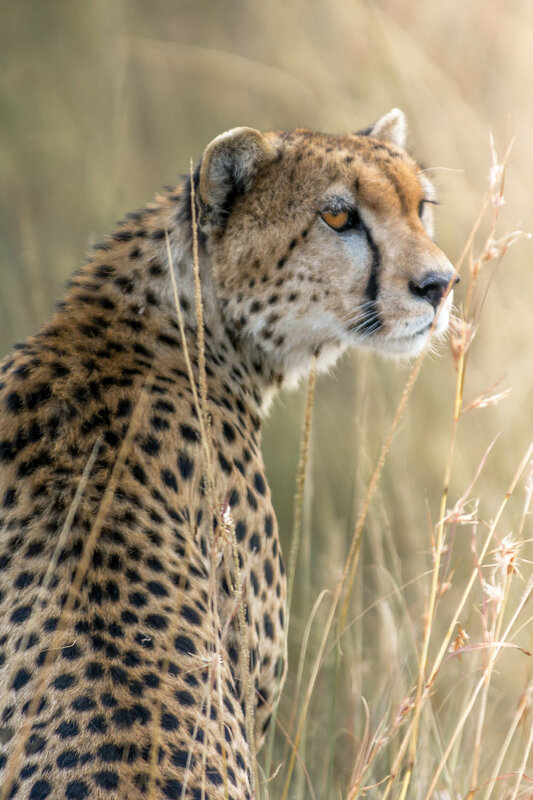 The real reason for our trip (sorry Malkia) was to go on safari in the Maasai Mara National Reserve. 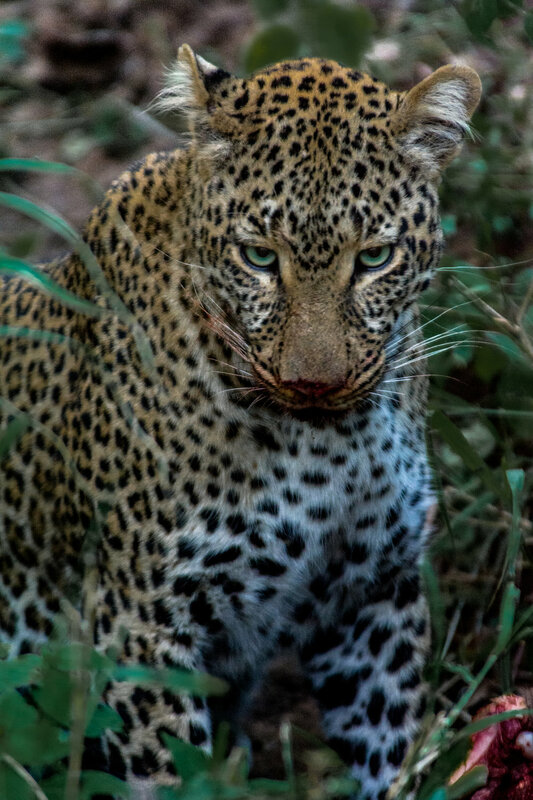 Since it would be impossible to write about the trip in a succinct way that would take you fewer than 5 days to read (one day for each day on safari), we have uploaded photos here. 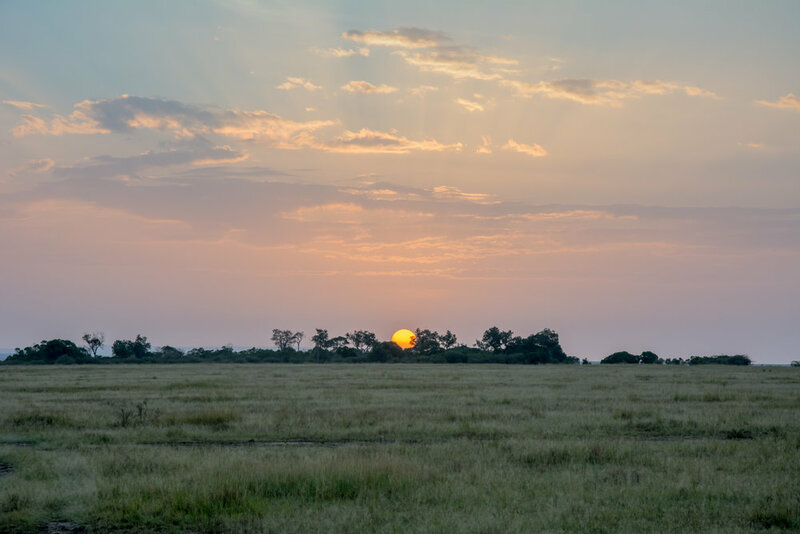 While many of the camps in the Reserve are probably excellent, we cannot say enough good things about the accommodation and staff at the Mara Intrepids Camp, and especially our driver, James. We were woken up each morning with a cup of tea and cookies before going on safari, and fell asleep each night with a warm hot water bottle to keep our toes warm while listening to the animals. We were surprised by the staff (who all knew our names and Ms. Sarah's obsession with Mango juice) with a special candlelight dinner under a gazebo, with packed breakfasts to eat while watching the hippos in the Mara River, and with a private catered breakfast on our last day. We visited a Maasai village, saw the view from a hot air balloon, and experienced a full rain storm from the comfort of a Land Rover Defender. We saw so much wildlife and gained so much respect and understanding of the ecosystem, thanks largely to James' never ending knowledge, patience (male lions are not as easy to find as you might think), and sense of humour. We are already planning our next trip back (mostly to see James again) but until then, the photos will have to do. As much as we love Vancouver, sometimes even the locals need to become visitors. So we packed our bags and spent a week in Providence, Rhode Island. We were there to meet our new nephews (aka 'new'phews), which provided the chance to explore Providence through locals' recommendations. Providence was founded in 1636 by Roger Williams, who had been exiled from Massachusetts for his religious beliefs. The city was one of the first to industrialize, and became known for its jewelry and silverware industry. While it has retained its manufacturing industry, the city is now known for its service industries thanks to the eight hospitals and seven higher-learning academic institutions that call Providence home. Providence has been rebranding itself as the Creative Capital to put more emphasis on its educational and arts community, which makes the city fun to visit and explore! The city is only 66 square kilometres in area (about half the size of Vancouver), but is divided into 25 distinct neighbourhoods, often grouped together by their character. The city is amazingly walkable, but also has an intuitive transit system (with very tourist-friendly drivers). The East Side is home to the charming Hope Street, with boutique shops and cafés. Some of our favourites on Hope Street include Stock Culinary Goods, a kitchenware store that has everything an amateur chef could need, and Seven Stars Bakery, a bustling bakery with a great hidden garden patio. For a great sandwich, head to The Cook and Brown Public House, and then indulge in a cone from Three Sisters for dessert (we highly recommend Dirty Garden Mint). If you happen to be in the area on a Saturday morning, Tippet Park hosts The Hope Street Farmers Market every week between May and October. The stalls of local fruits and vegetables, seafood, baked goods and artisanal crafts cater to the large crowds that come out every weekend. Downtown Providence is the city's urban centre, with everything from 19th Centrury Victorian architecture to post-modern and modernist buildings. We wandered up and down Westminster Street, which features tree lined brick sidewalks and suspended fairy lights. Small shops and restaurants open onto the street, providing lots of visual interest with window displays and people watching. The street is also home to the Arcade Providence, America's first enclosed shopping mall. Built in 1828, this Greek Revival structure is beautifully maintained, with shops on the main floor and micro lofts on the second and third floors. Living up to its moniker as the Creative Capital, Providence is proud of the large public art pieces on buildings all over the downtown core. Between The State of Rhode Island State Council on the Arts, The Public Art Committee of Brown University, and the Rhode Island School of Design's (RISD) emphasis on public art, there seems to be something to look at from every street corner. One of our favourites was the Providence Industrial Mural (50 Aborne Street) by Shepard Fairey, a RISD-educated street artist. And if you want to immerse yourself in academia, visit College Hill, an old residential neighbourhood that also includes the Brown University and RISD campuses. More interesting than the campuses may be the surrounding homes, many of which have historical plaques with the year they were built and the homes' first owner. Nestled among the houses at Prospect Terrace Park is one of the city's best lookouts - but try to get there before the tour busses arrive. The creative and academic population has also given way to restaurants and cafés that focus on local, high quality ingredients. The small and aptly named Kitchen (94 Carpenter Street) in Federal Hill is known for its phenomenal breakfast and (with under 15 seats inside) lineup. If it's coffee (or tea) you're after, try The Shop in Fox Point. This small coffee shop focuses on quality and hospitality. Downtown, places like Birch Restaurant and Gracie's offer prix fixe tasting menus that feature local and seasonal items. Birch has a clean interior with exposed brick walls and a u-shaped table offering a communal dining experience. Next door, Gracie's hires staff from the local Johnson and Wales Hospitality School and serves up meticulously detailed meals as impressive in taste as they are in presentation.